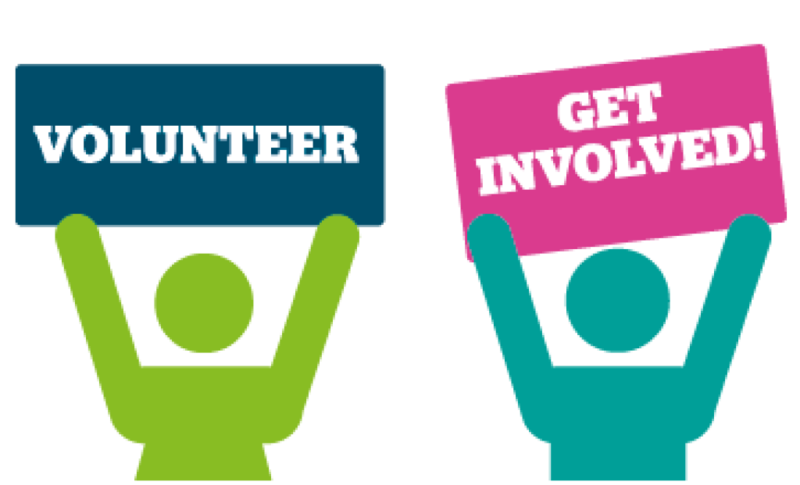 We invite you to become an active participant and volunteer at Immaculate Conception Church! Faith is what God gives to you…giving back to others is your gift to Him. Please take some time to look at the many opportunities we have for you to get involved! IC Prayer Network -Dedicated parishioners pray for those who are in need of prayer or would like to request prayer. If you would like to join this important ministry, are in need of prayer or would like to request prayer, please see the phone numbers in the church bulletin. Pastoral Ministry - Interested parishioners volunteer to serve our homebound and elderly parishioners as well as Catholics in nursing homes. For further information or if you need a visit from the priest for a loved one or friend, please contact the Church Office. Cursillo - The Cursillo movement strives for Christ to be the prime influence in society. Cursillo is a simple method to develop Christian spirituality, mentality, activity and community. The prime objectives of the Cursillo movement in Arkansas are to develop in adult Christians a consciousness of their power and mission to become leaders in the work of Christian renewal, and to sustain them as they provide a Christian leaven in civic, social and economic life. Prayer Shawl & Teddy Bear Ministry- The mission of the Prayer Shawl and the Teddy Bear Ministry is to bring comfort, joy and love to those who may be discouraged or sorrowful. Shawls are made by hand, threaded with Blessings, Love and Prayers by members of our parish and the Teddy Bears are part of the collection of a member of the Immaculate Conception Ladies Auxiliary. If you know of anyone who is in need, please call Barbara Bearden 479-785-2259 or Melanie Donaubauer at 479-769-4223. 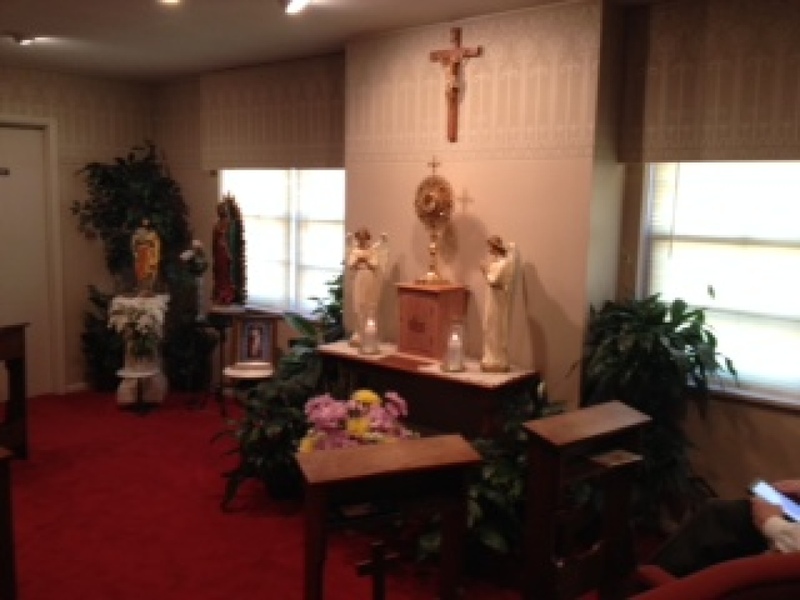 Perpetual Adoration of the Blessed Sacrament- The Adoration Chapel is located in the rectory of St. Boniface Church-1820 North “B” Street, and offers quiet time in prayer in the presence of the Blessed Sacrament 24 hours a day, 7 days a week. This chapel is a combined effort of Immaculate Conception, Christ the King, St. Boniface and Sacred Heart of Mary Parishes. Please call Rudy and Dorothy Gramlich at 479-452-7595 or John and Joyce Becker at 479-783-8569 if you are interested in joining the adorers group. Heart of Jesus Prayer Group- This prayer group meets on Wednesday evenings at 7:00 pm in the Parish Hall at St. Boniface Church. It is a Charismatic Renewal prayer group that focuses on the gifts of the Holy Spirit. Music Ministry - Immaculate Conception Adult Choir-is open to anyone who would like to participate. Contact the Church Office for more information. Immaculate Conception School Choir-sings at the 10:00 am Sunday liturgy the third Sunday of every month during the school year and Christmas Eve services. The Funeral Choir-Volunteers who sing at parish funerals. Immaculate Conception Adult Choir - is open to anyone who would like to participate. Contact the Church Office for more information. Hispanic Choir-practices on Monday evenings for the 12:00 noon service on Sunday and on Thursday evenings for the 2:00 pm service. Contact the Church Office for more information. Lectors- Lectors proclaim the Word of God at our celebration of the Eucharist. Each lector is assigned a liturgy at which to read. Extraordinary Ministers of Communion - At our Eucharistic Celebrations, the Ministers of the Eucharist distribute Holy Communion to the faithful. The Ministers also bring the Holy Eucharist to those who are homebound. Altar Servers - Altar Servers assist the Celebrant at our Liturgical Celebrations. 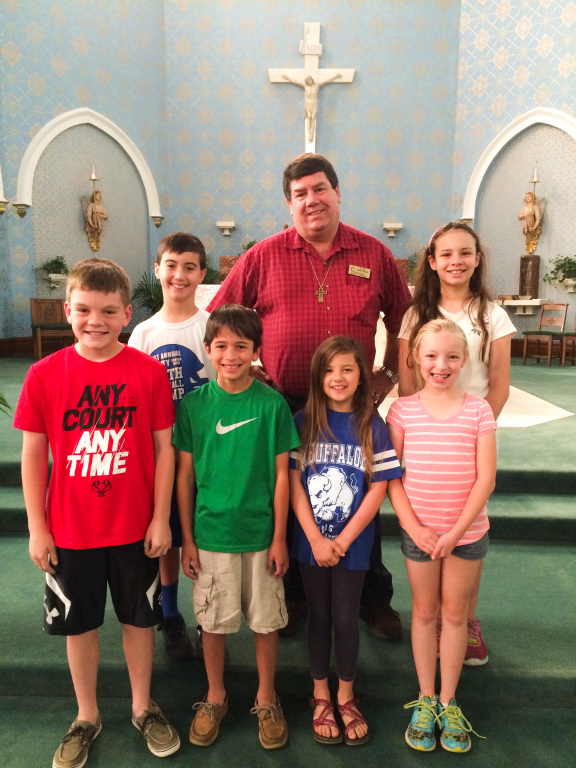 Altar server training is offered to boys and girls, 4th grade and up. Ushers - Our ushers assist the assembly within our worship space. They greet those attending Mass, gather our gifts, coordinate the Communion procession and are helpful in many other ways. For more information and to sign up to participate in these Liturgical Ministries, please contact the Church Office. To see the Minister Schedule. For more information and to sign up to participate in these Liturgical Ministries, please contact the Church Office. Parish Religious Education (PRE) -Immaculate Conception offers a comprehensive religious education program for students in grades 1-12 who attend public schools. This program meets diocesan guidelines and is staffed by catechists who are either diocesan certified or working towards diocesan certification. These classes are offered on Wednesday and Sunday evenings, August-May. Registration dates will be announced in the Church Bulletin over the summer. For specific information about First Reconciliation and Communion, and Confirmation, please refer to the “Sacramental Preparation” section in this guidebook. Sunday School for Children Ages 3 & 4 - We are offering this program during the 10:00am Mass on Sunday. If you have a child in these age groups, and you are interested in participating, please contact the Church Office. Vacation Bible School- VBS is offered to children ages 4-10 for one week during the month of July and is staffed by volunteers. Check Church Bulletin or call the Church Office for information and dates. 4:12@IC Youth Ministry- Immaculate Conception Church offers a comprehensive youth ministry program that includes social and community building activities, catechesis, service projects, youth Masses and prayer and worship services called 4:12@IC Youth Group. This program is open to all youth in grades 9-12 regardless of Church or religious affiliation. Youth Mass is every Sunday at 5:00 pm followed by a Youth Night from 6:30-8:00 pm. For more information, contact the 4:12@IC Youth Group Coordinator or visit the 4:12 Youth Group webpage. Circle of Grace Safety Program - Required by the Diocese of Little Rock, beginning on July 1st, 2017, employees and volunteers with routine contact with minors MUST do Safe Environment Training and submit to a background check. This includes only volunteers who have routine contact with minors as an essential part of their volunteer duties. Volunteers who do not have routine contact with minors as an essential part of their duties DO NOT HAVE to do Safe Environment Training or submit to background checks. We will no longer use VIRTUS’s “Protecting God’s Children” or “Touching Safety.” Instead, we will use products supported by Catholic Mutual Group (CMG). All data from VIRTUS will be moved over to CMG Connect. No one who has already done safe environment training and a background check will have to re-do anything at this time. Users who are due for a 5-year recertification will be notified how to do that by the Religious Education Director, who will also have info on both new programs. Adult Formation- There are a variety of opportunities for Adult Formation and Spiritual Growth at Immaculate Conception. We regularly offer Adult Scripture Study Groups, Catechetical Training Sessions, Sacramental parent meetings, Lecture Series, Keynote speakers, Prayer Groups, Parish Missions, Seasonal Days of Recollection and Reflection, etc. Information about these programs can be found in the Church Bulletin as they become available. Library- Our Parish Library is located in the Church Office building. Books are available on a wide range of subjects related to spiritual life and the Church. The library accepts donations of books and tapes that are appropriate for a Church Library. All parishioners are invited to enjoy the library during the hours of 8:00 am - 4:00 pm, Mon. thru Thurs. St. Anne’s Society Assistance Program - In an effort to address the growing needs of the homeless community and the low-income families, the three Catholic churches – St. Boniface, Christ the King and Immaculate Conception- founded the St. Anne’s Society Assistance Program. This program provides assistance with utility bills and housing. Assistance is granted based on availability of funds. Due to the growing need, the program is only able to help a given person once every 12 months. The program is only available for residents of Sebastian County. On October 3rd, the St. Anne’s Society Program moved to the Riverview Hope Campus at 301 S. E Street in Fort Smith. St. Anne’s Society staff will be available to talk to people and, if funds are available, provide financial assistance at the new location. To learn more about the Riverview Hope Campus, please visit riverviewhopecampus.org. If you would like to contribute to the St. Anne’s Society Assistance Program, you can place your donation in the Poor Boxes located at the entrances of the Church, place it in the collection basket in a marked envelope, or bring it to the Church Office. The Harris Project - Father Jack Harris (former IC associate pastor) initiated work with the Sebastian County Juvenile Detention Center that continues through the efforts of Immaculate Conception Parish. Every Friday, members from Immaculate Conception parish go to the juvenile section of the Sebastian County Jail to visit and counsel with the detained youth. One Friday a month, Immaculate Conception Parish sponsors what is known as a free world meal for the imprisoned boys and girls. Instead of the normal institutional food; the qualifying kids are fed a special meal. The food for this special meal is purchased by the church and prepared by parishioners. To learn more about the Harris Project, call Lucy Buergler at 479-452-8222. Clothes Closet- Immaculate Conception parish is active in efforts to help support the responsible poor with clothing needs. Old, new, unused, unwanted or outgrown clothes are appreciated and accepted by The Clothes Closet. The Clothes Closet makes every effort to see that those without sufficient or suitable clothing have their basic clothing needs met. To learn more about the Clothes Closet, call Clyde Chaney at 479-783-8150. Pantry of St. Veronica - Located in the Riverview Hope Campus and part of our St. Anne’s Society Assistance Program, the Pantry of St. Veronica, aims to assist the poor and homeless in our community by providing personal hygiene products and other essential items. Year round, the Pantry parishioners and other community members donate body wash, razors (men and women), shaving cream, deodorant, lip balm, insect repellent, sunscreen, shampoo, body lotions, and small flashlights that are later given to people that come to the church office seeking help. Supplies can be delivered to the Church Office. General Service- Many parishioners volunteer time and talent to local community organizations by serving on boards, committees, and work crews. For further information on how you may contribute to these efforts, contact the Church Office or your Parish Council. Immaculate Conception Ladies’ Auxiliary- Membership is open to all women of the parish. Its membership provides fellowship and service to the parish. The ladies also meet every Wednesday at 9:00 am in the St. Anne’s Building to work on projects for their annual Fall Bazaar - their main source of income for funding special projects throughout the year. They also meet the first Tuesday of each month for a Business Meeting. Monday Night Bingo - Every Monday night from 7:00 pm to 9:00 pm in the Parish Center. Doors open at 6:30 pm. All proceeds go to the St. Anne’s Society Assistance Program to help the needy. Everybody is invited! “Amistad” Multicultural Ladies Group - Open to all women of the parish, this is a multicultural and bilingual group where members share their talents (culinary, crafts, sewing, knitting, etc.) to raise funds destined to help families in need within our parish. The group meets on Mondays 6:30-8:00 pm in St. Anne’s Hall. Men of Faith - Open to all men, this group meets at 6:00 am every Friday in St. Anne’s Hall for a Bible study. Boy Scouts- Immaculate Conception Parish has an active Boy Scout and Cub Scout program. Sign-ups take place in the summer. Contact the school for more information. Girl Scouts- Immaculate Conception Parish sponsors Girl Scout Troops open to girls in grades K-6. Sign-ups take place in late August. Contact the school or call the Mount Magazine Girl Scout office at 479-452-1290 and they will assign you to the age-appropriate troop within our organization. Church League Baseball - Immaculate Conception Parish sponsors church league ball teams, grades K-9. Watch for sign-up dates in the Church bulletin in January. 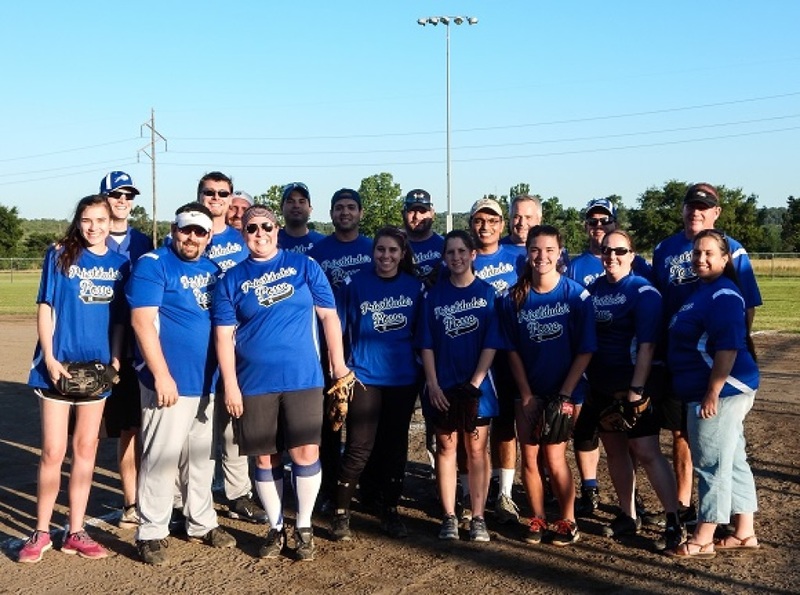 Adult Softball - Immaculate Conception Parish also sponsors an all-male softball team for ages 18 and older. Check weekly bulletin for sign-up dates. Parish Picnic and School Social -Held annually on the last Sunday in September. The Parish Life commission of the Parish Council coordinates with the School, the Hispanic Committee and Ladies’ Auxiliary for this event. 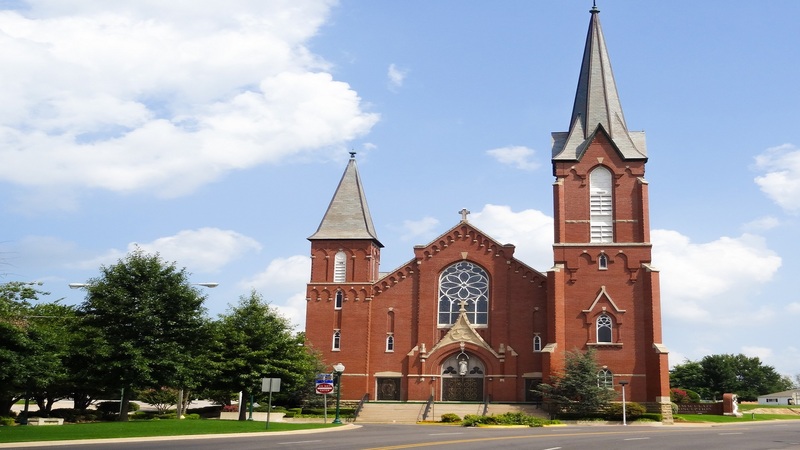 Special Receptions - Parish Life Commission is asked from time to time to coordinate receptions for special events. Some of these include-RCIA reception after Easter Vigil service, First Communion Reception, Confirmation reception, and Reception for High School Graduates.